I was first introduced to Quetzal Guerrero’s music by way of Osunlade’s Ibara: River Crossing album on the highly trusted Yoruba Records label. His track Raimunda (which also appears on the new album) was actually one of my favorites on Ibara, so I was excited to see him signed to a full Yoruba label release (4th release overall) and just as excited to hear his musical offering. 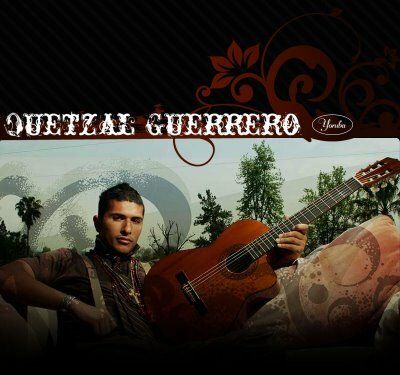 An extremely talented violinist, guitarist, and vocalist, Quetzal is one of those artists to keep an eye on in the future. Embracing his rich heritage of Native American, Mexican and Brazillian lineages, he respectively holds it down in the Latin/Soul/House genres, adding his own flair to the flamboyance these musical styles encompass. The sounds of samba, batucada, hip hop, acoustic, and Yoruba praises are also represented in this eclectic release. The strengths of this album (in my opinion) lie in the violin/guitar solos, percussion, and language, each contributing its own rhythm and color. These hues then meld as a whole, much like that vibrantly painted mural you pass by while driving, admiring it more and more with each passing. This album is for those who allow music (and other artistic endeavors) to grow on them much like this one has/is doing on me. Now – Bouncey drums, floating guitars and violin – “Enjoy your life as it is Now”. Beautifully said. –Tudo de Voce – Niiice samba – grab your Caipirinha de Tangerina , your hammock and chiiiilll out..
–Rumba a Yemoja – Yoruba Records soulful Afro-House at its best. Voted most likely to appear in a Junior Star deejay set. –Raimunda – Fav track. If you don’t dance to this then something is definitely wrong. Pick this one up from the links through his myspace page. 1=Don’t waste your time like I did mine. 2=Waste your time like I did mine but I dare you to disagree. 3=Well, there was the single. 4=If it were a hand in spades there’s “two and a possible”. 5=It’s a “good” album. Meaning at least 3 or 4 solid songs. 6=Really Good Project. Has the “Rewind Factor” more than once. 7=The number of completion. Great Album. Instant Classic.